In the world of Uber Eats and value menus, how do independent restaurants and restaurant chains convince customers to actually eat inside of their stores? The past decade has fared well for the restaurant industry, especially the fast casual concepts, but with increased competition can “good food, fast” really be enough? 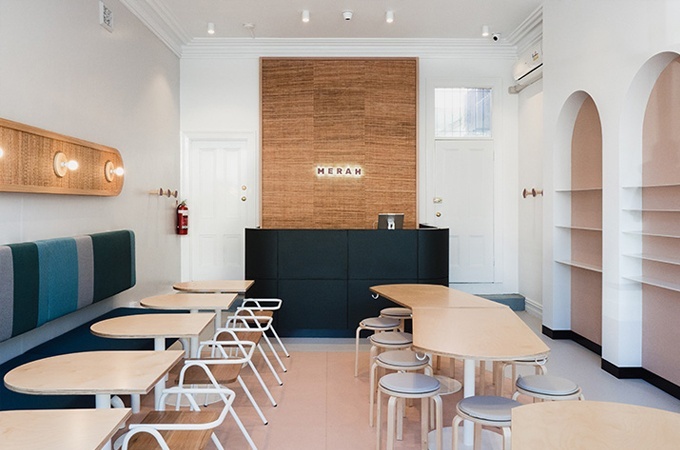 Minimal design has its place in the restaurant world, especially when the space is small and the menu is focused, we totally believe in letting the food speak for itself. In reality, minimal design can feel cold and uninspired to a consumer. Like it or not, we’re edging close to the saturation point when it comes to the “Kinfolk” inspired interiors with their lackluster stark white walls, distressed reclaimed wood tables, and kitchy trinkets. As menu items become more colorful and the overall footprint of restaurants become more compact (and less cluttered), every design detail matters. 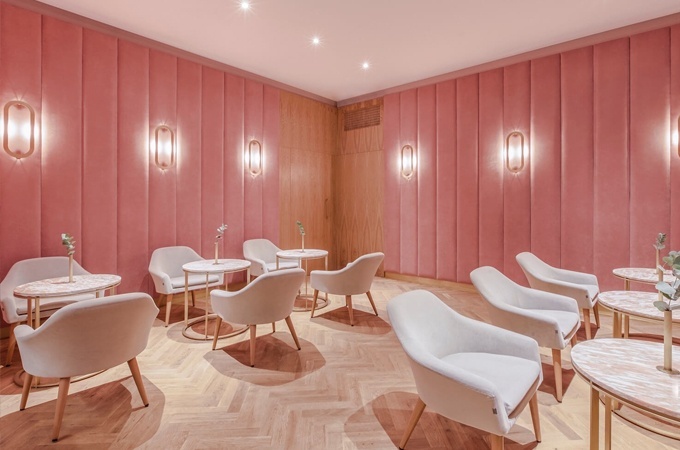 From bespoke statement lighting, to custom booths (one thing millennials hate are cheap looking booths) and bold color choices, every detail should help tell your story. If you’ve followed any residential interior designers on Instagram this past year, then this next trend will come as no surprise to you. This year has been the year of bold, graphic wallpapers! 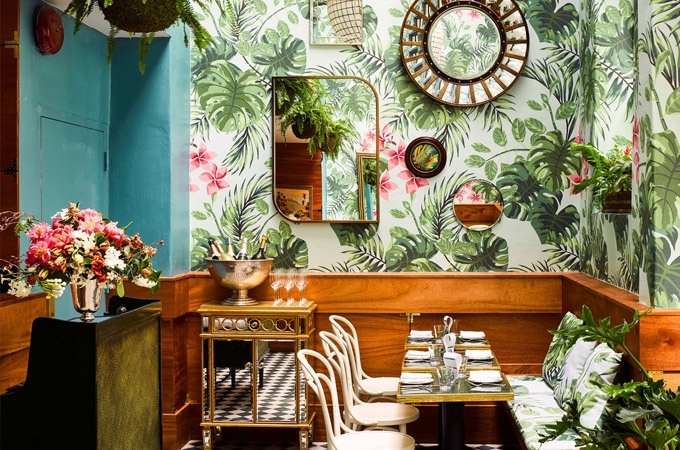 Seemingly overnight, we’ve been thrown into a chic jungle of palm leaves and florals, from Leo’s Oyster Bar and The Winsome to Holy Matcha and The Royal Palms Shuffleboard Club. Next year promises to be another exciting year of wallpaper, as it’s often a cost-effective way to add drama and flair to a blank space. 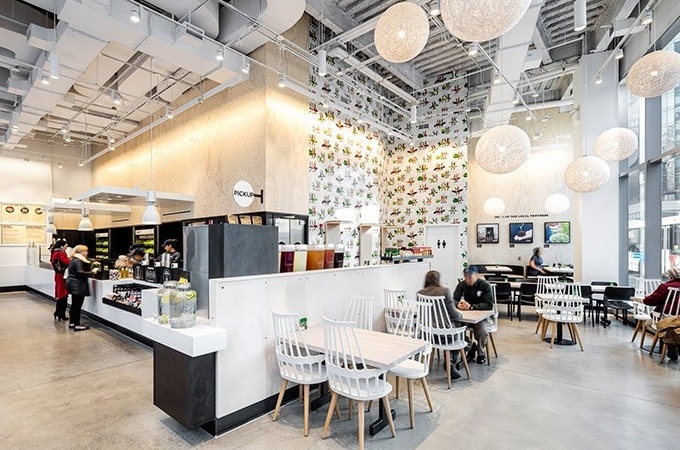 However, in 2018 we expect to see more creativity when it comes to restaurants and wallpaper, like the custom designs featured at Chopt Creative Salad Co.
Chopt’s creative director, Julia Sherman (@saladforpresident), teamed up with the Spanish design duo, baTabasTa to create the one of a kind graphics that adorn their walls serving up quite a trendy feast for the eyes. The futuristic space cowboys (or the gender neutral “cowpeople”?) highlight the whimsy and creativity behind the company’s signature salads and unique flavors, differentiating them from their biggest competitors in the salad segment and telling the brand’s story at the same time. 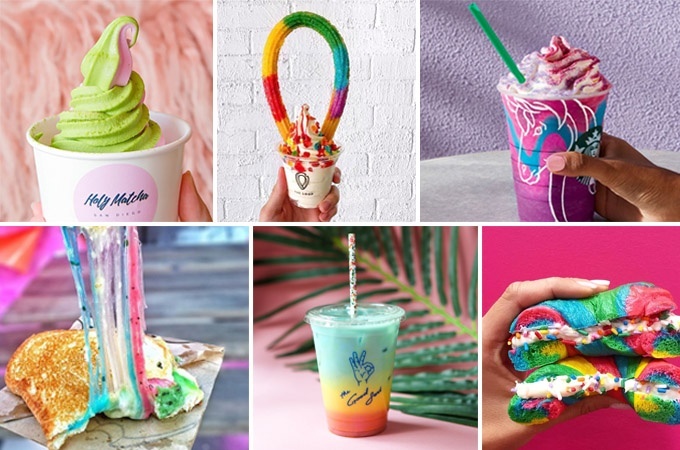 Food writers have been busy covering this year’s hottest restaurant trend, vibrant “unicorn” themed food. Unlike Heinz’s failed colorful ketchup experiment of 2000 (the world just wasn’t ready for it), this colorful food trend is going to continue making waves well into 2018. Even Starbucks jumped on the trend with their now infamous Unicorn Frappuccino which combined magical swirls of fluorescent pink and purples and flooded the internet and social streams with eye candy for weeks! It’s not just our food that’s getting a boost of color, restaurant chains are taking a risk by venturing away from neutrals, making a play at the younger demographics desire for a more holistic (less cheesy) approach to restaurant design. We predict in 2018 you'll see sublime pastels balanced by strong jewel tones making their way into your favorite spaces (think honey yellows, dusty blues, and olive greens). 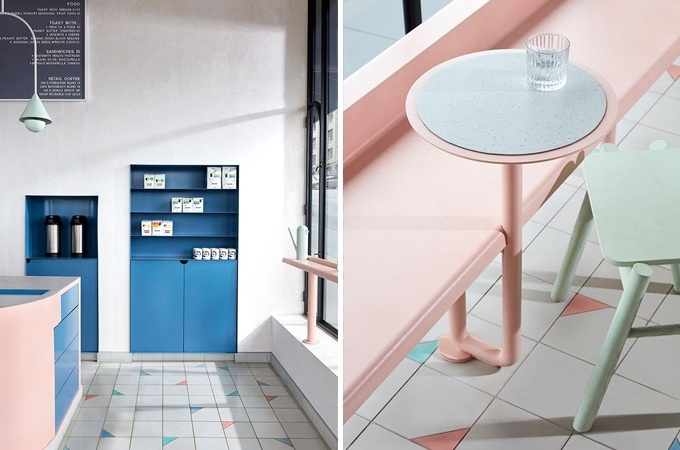 Adding color to restaurant chairs, table bases, walls and floor tiles is a fun way to integrate this trend. We’re smitten with the newest Tender Greens location. 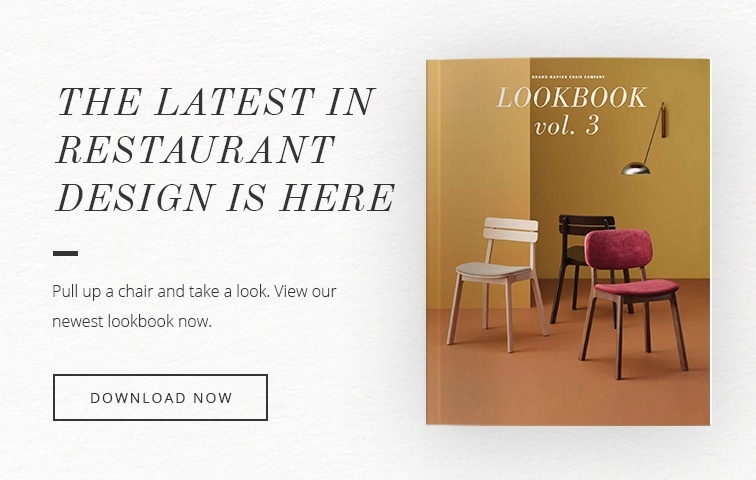 Designed by Design Hutch, the redesign leverages the best of our favorite restaurant trends: colorful seating, signature tiles, and tons of natural light. 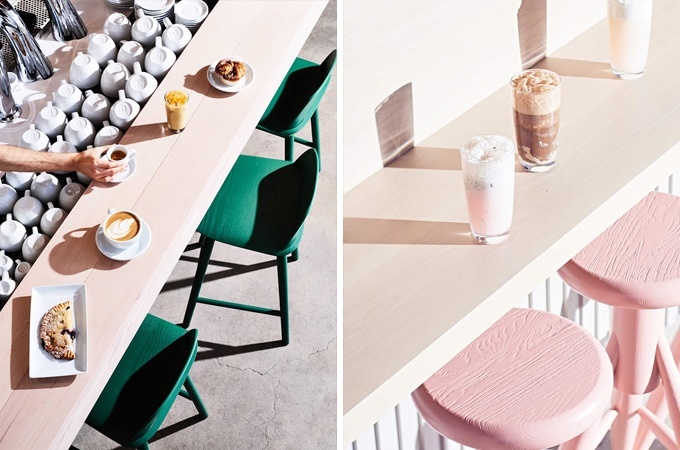 Vacation Cafe by Therefore Studios and Virtuous Pie by David Dworkind are also prime examples of how to execute this trend to perfection. Let’s just pretend that restaurants laden with natural wood details are the restaurant world’s answer to the cozy “hygge” trend. If you’re like me, you’ve been on the rollercoaster of emotion that is the reclaimed wood movement, at first falling head over heels for the sustainability story and then rolling your eyes every time another chain rolls out their newest concept starring...you guessed it, reclaimed wood. And let’s face it, because of its popularity, authentic reclaimed wood is expensive and can at times be hard to find. That being said, the wood movement is far from over. 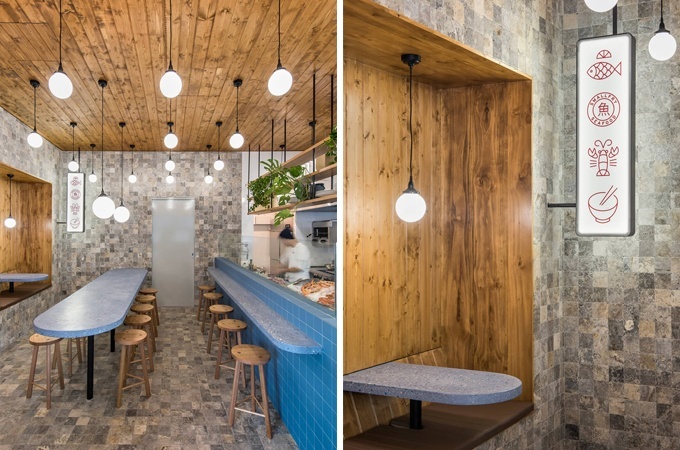 One restaurant design trend we’re forecasting is the use of White Oak, Ash, Walnut, and Hickory wood species on walls, ceilings, table tops, and bars to create a cozy and inviting space. Each of these species have a signature grain pattern, texture, and color that sets them apart from traditional woods used in restaurants. Smallfry does an excellent job of balancing textures, colors, and styles in their space, and we love how the nook brings the wood from the ceiling down onto the wall to break up the stone. 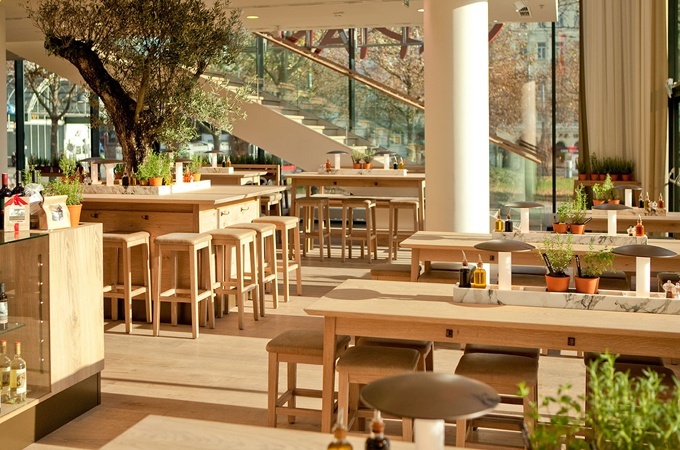 Vapiano is an Italian fast casual chain that successfully utilizes wood seating, tables, and millwork to create a calming, natural feeling restaurant that doesn’t blur together with other fast casual concepts. And if you’re really looking to have your mind blown, check out Savio Volpe designed by Ste Marie. Thanks to the popularity of communal tables, non-traditional seating arrangements have become a common occurrence in the restaurant industry. Industrial designers have continued to redefine the boundaries of what restaurant seating can look and feel like, and we predict more non-traditional seating options will be available in 2018. Comfort will be key in 2018 (and beyond), and you’ll see restaurants offer a more multi-use approach to their seating layouts—especially in fast casual and casual dining spaces. It’s simple to do, just add couches, lounge chairs, and low tables to easily break up the space. People want experiences, they want options, and they want to feel comfortable, and creating a mixed-use approach to restaurant layouts help deliver all of that. 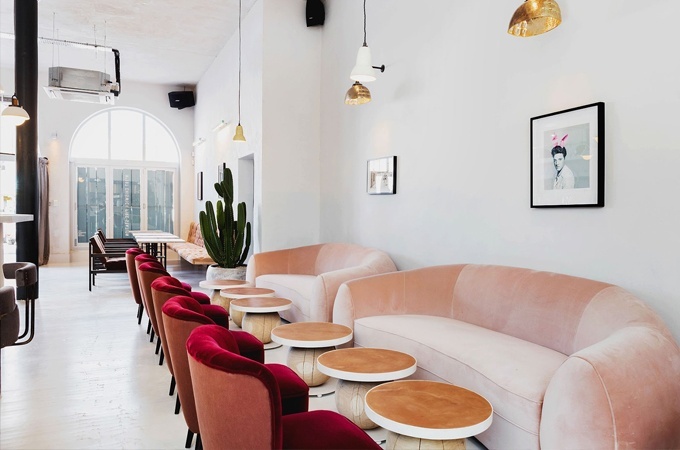 With the continued impact of social media on restaurant design and a younger demographic population with more buying power taking center stage, color, comfort, and authenticity are going to play a major role in shaping restaurant design trends over the next few years. Are there any restaurant design trends you’re hoping to see disappear in the next year, or something new that you hope is going to take off? We’d love to know!